I made the obvious joke that it must be me, hahaha, and then dolled out some seriously enthusiastic congratulatory ‘well dones, great jobs’ or similar. For as long as I’ve been visiting the Chicago Ninja Academy, I’ve seen a heap of girls attempt the Warped Wall and Sarah’s the only one that’s come close…. and there’s a reason for that. 1.) Sprinting. Get Great at sprinting. The first thing I ever said to Sarah was “Are you a sprinter?” and it’s because she tackled the wall in the same way most dudes do; maximum explosive energy and enthusiasm. Generally, girls don’t generate nearly enough power when running towards the wall, and then kind of end up spinning their wheels as soon as it inclines. To me it makes sense, when do girls sprint? 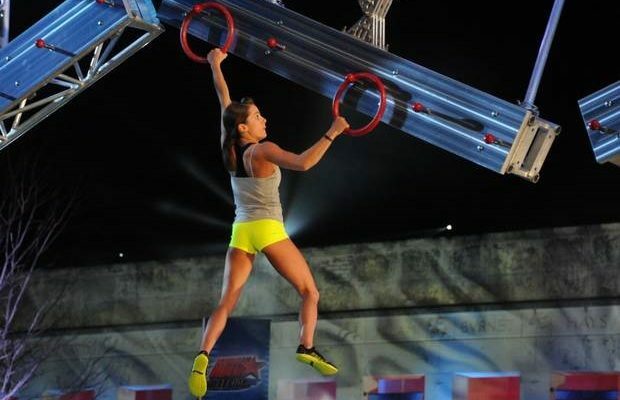 Soccer, Netball, Basketball, running, they’re all endurance… It’s no accident that the majority of successful females in American Ninja Warrior did pole vaulting in College. Basically, in my opinion, there’s no point in training for Ninja Warrior if you can’t do the wall… and you can’t do the wall if you can’t sprint. Get on it. Girls have two main advantages to dudes: Power-to-weight ratio and flexibility. Girls tend to be better rock climbers because they use their legs instead of their arms… but that’s not going to cut it in Ninja Warrior. Too many of the obstacles require traversing a space while hanging and so to take advantage of that superior power-to-weight you’ll need to be able to move across, side to side and up and down using only your hands. Apparently only 3% of women on the planet can do a pull-up. You need to be in that 3%. You can start with those bands, or the gym dip-machines or a negative pull-up (jumping up and lowering yourself slowly)… it might take a few months… but that first pull-up you do will be the most exciting thing ever, I promise. The average height of women who compete tends to be lower than the average height of men who compete, and there will be a couple of obstacles where the lack of height and wingspan will be detrimental…. so the solution is to become as flexible as possible… use every millimeter of your body! If you need to do a full split to tackle the Jumping Spider, then make sure your legs can bend that way. Flexibility and agility can overcome height limitations, just ask any Kacy Catanzaros. I’m making a not-cool generalisation here, but I’ve noticed the girls I train with usually struggle with powering off the mini-tramp. I don’t know if it’s a technique thing, or a confidence thing, and it’s easily overcome but you don’t want to be trying a mini-tramp for the first time when you’re actually running the Ninja Warrior course. Maybe cos dudes aren’t always that bright, but we generally seem happy to propel ourselves into space off a mini-tramp, girls are more cautious and so often I see a good run up, but then the knees buckle slightly coming off the trampoline and all the momentum is lost. When you hit the tramp your whole body needs to be rigid aka taut to use the power the tramp gives you, it definitely requires a bit of practice. Obviously these are tips for everyone regardless of gender, this post is merely here to help combat some patterns I’ve noticed. Hope everyone’s training is coming along smashingly! → Countdown to the comp! 9 tips for Obstacle Course prep.